Most educators are familiar with student response systems (SRS) a.k.a. clickers. Common brands are eInstruction, Sentio, TurningPoint, Activote. Those who use the systems know they run about $2,500 - $4,000 (depending on various options selected) for a class set and allow educators to track student learning, engage an entire class as they collect real-time responses from students, and enables them to quickly assess understanding and achievement. While these are valuable instructional outcomes clickers are costly and the distribution, collection, and maintenance of devices is rather cumbersome. In many cases using them requires training to figure out how to upload the software, input questions, maneuver from one question to the next and share answers. Additionally, the devices have an old-style, phone-like keypad without a letter on each button that makes submitting a response quite tedious. The clickers just don’t look like the technology students use in real life. Even some teachers in schools where these devices have been purchased aren't using them because of the these reasons. 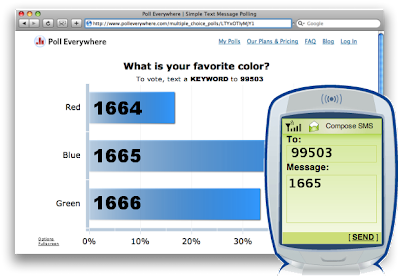 Fortunately for teachers who incorporate cell phones into instruction there is Poll Everywhere, which serves not only as a student response system, but also provides educators with a terrific alternative to the direct to phone text. Poll Everywhere provides students with a simple method to share their ideas right from their phones. Teacher can set up various free text polls to gather information from students and keep the responses private or make them public. Educators can view individual student answers in their web browser or download them as a spreadsheet. They can then import answers into course management systems like Blackboard/WebCT or Moodle. Student identity is established with a simple device registration process. On mobile phones, students simply enter their student ID and the link to all future answers is established. There are endless ways this tool can be used to enhance learning. 1) Set up a homework help poll for a particular assignment or unit of study. Students can simply text in the questions when they have them. This could set the stage beautifully for the next day's lesson enabling the teacher to differentiate instruction based on student need. 2) Have students respond to a discussion topic. 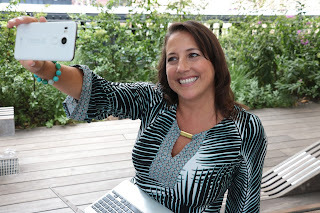 The teacher shares the topic and students text in their answers to be viewed publicly or privately by the teacher. 3) Of course, what Poll Everywhere does better than the rest, is polls. Need to do a quick check for understanding? Poll your students. Want them to vote on a favorite character in a book? Poll your students. Collecting data on a science experiment? Poll your students. Poll Everywhere provides educators with the ability to know what all their students are thinking at anytime and works great as a pre and post assessment quizzing tool. Students will have no problem figuring out how to use Poll Everywhere. They use this technology all the time when watching and voting on their favorite television shows. Here's how. Have students put the number 99503 or 22333 into their phone. Students text Poll Everywhere at 99503 or 22333 and enter the code that corresponds to their answer. I like the idea of incorporating a tool that students are already familiar with into lessons. I also like that there's not a big cost as in so many of the response systems that have proprietary software. I teach young students, so I don't think this would be an option for them... yet. Great blog, I love hearing about progressive teachers who are pushing the envelope of classroom response systems. I agree that clickers are arduous when compared to smart phones and tablets nowadays. Via Response has a similar offering to P Everywhere, they just add a few more features such as the ability to track and grade via a cloud-based system (so you can grade and send assignments out during the weekend if you wish, or just prepare them then). They allow media in homework too (e.g. pictures). Polling is also a specialty of Via Response so you can pre-generate them and incorporate them into your PowerPoint presentations, or you can make them on the fly. You should check them out, they're much cheaper than clicker systems.